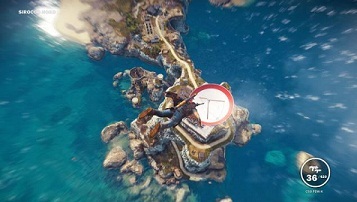 Di Ravello tapes are the audio diaries of the dictator and general Sebastiano Di Ravello in Just Cause 3. The general took over all three regions of Medici, and your job is to liberate the island. Using Di Ravello audio diaries, you will get to know much information about the antagonist. In our guide we'll show you the locations of all Di Ravello Audio Tapes / Diaries and thus unlock the achievement Golden Urga Mstitel attack helicopter. The Di Ravello audio diaries are scattered all across the three regions of Medici. Insula Fonte holds 20, Insula Dracon 12 and Insula Striate 39 of the diaries. The following lists show you the locations, including the coordinates. Diary 1 located in a small house: coordinates - N 40 - 38.40 / E 5 - 42.37. Diary 2 located between two banks: coordinates - N 40 - 38.65 / E 5 - 42.65. Diary 3 located east of the gas station: coordinates - N 40 - 38.95 / E 5 - 42.66. Diary 4 located on a balcony that points north: coordinates - N 40 - 39.29 / E 5 - 42.87. Diary 5 located on a balcony at the White House: coordinates - N 40 - 40.07 / E 5 - 43.71. Diary 6 can be found on a bench: coordinates - N 40 - 40.16 / E 5 - 42.76. Diary 7 located opposite the white fence: coordinates - N 40 - 40.69 / E 5 - 43.53. Diary 8 hidden behind the screens: coordinates - N 40 - 40.95 / E 5 - 44.18. Diary 9 located on a balcony in the orange building: coordinates - N 40 - 40.76 / E 5 - 45.20. Diary 10 can be found next to the gas station: coordinates - N 40 - 41.58 / E 5 - 44.68. Diary 11 it is in the car wrecks: coordinates - N 40 - 42.36 / E 5 - 44.37. Diary 12 located near the vineyards: coordinates - N 40 - 42.47 / E 5 - 44.20. Diary 13 located at the airport tower: coordinates - N 40 - 42.51 / E 5 - 43.95. Diary 14 can be found opposite the metal gate: coordinates - N 40 - 42.25 / E 5 - 43.78. Diary 15 it is on the balcony in the eastern part of the yellow house: coordinates - N 40 - 42.37 / E 5 - 42.86. Diary 16 located on the roof garden: coordinates - N 40 - 42.73 / E 5 - 43.29. Diary 17 can be found in the house near the tower: coordinates - N 40 - 42.88 / E 5 - 43.00. Diary 18 located in the brick building on a balcony: coordinates - N 40 - 42.42 / E 5 - 42.03. Diary 19 can be found north of the police station on the balcony of a building: coordinates - N 40 - 41.95 / E 5 - 41.59. Diary 20 it is on the woman toilet Gas stations: coordinates - N 40 - 41.84 / E 5 - 42.34. Diary 1 can be found on the second level of the ruins: coordinates - N 40 - 44.25 / E 5 - 35.49. Diary 2 located in the bottom of the yellow building: coordinates - N 40 - 44.13 / E 5 - 36.80. Diary 3 can be found near the national flag: coordinates - N 40 - 43.60 / E 5 - 35.84. Diary 4 located next to the old car wrecks: coordinates - N 40 - 43.39 / E 5 - 37.05. Diary 5 located next to a trash can: coordinates - N 40 - 42.19 / E 5 - 37.60. Diary 6 located in a dark building: coordinates - N 40 - 42.93 / E 5 - 35.18. Diary 7 located at the top of the lighthouse: coordinates - N 40 - 42.69 / E 5 - 35.07. Diary 8 can be found under a wooden framework: coordinates - N 40 - 41.93 / E 5 - 35.03. Diary 9 located next to a boat: coordinates - N 40 - 41.77 / E 5 - 35.14. Diary 10 it is below the lamp: coordinates - N 40 - 41.87 / E 5 - 35.79. Diary 11 can be found on the ruins: coordinates - N 40 - 41.80 / E 5 - 36.47. Diary 12 it is again under a wooden framework: coordinates - N 40 - 41.84 / E 5 - 36.97. Diary 1 located at the top of the mountain: coordinates - N 40 - 48.09 / E 5 - 43.36. Diary 2 can be found in a house south of the jetty: coordinates - N 40 - 49.26 / E 5 - 46.25. Diary 3 can be found in a house south of the jetty: coordinates - N 40 - 50.31 / E 5 - 44.98. Diary 4 located adjacent to the fountain: coordinates - N 40 - 50.93 / E 5 - 41.21. Diary 5 located in the destroyed house - N 40 - 49.97 / E 5 - 40.11. Diary 6 located at the edge of a ravine - N 40 - 48.52 / E 5 - 40.75. Diary 7 located at the docks - N 40 - 47.51 / E 5 - 39.93. Diary 8 located in a building without a roof - N 40 - 45.98 / E 5 - 42.16. Diary 9 it is in the control room of a factory - N 40 - 44.91 / E 5 - 42.22. Diary 10 located on the stairs of a ruin - N 40 - 45.38 / E 5 - 39.07. Diary 11 can be found on the top of the tower - N 40 - 46.18 / E 5 - 39.16. Diary 12 it is hidden between the columns - N 40 - 46.99 / E 5 - 38.30. Diary 13 lying on the stairs of ruins - N 40 - 47.54 / E 5 - 37.78. Diary 14 located on the north side of the vault - N 40 - 47.40 / E 5 - 36.05. Diary 15 can be found in the ruins - N 40 - 48.22 / E 5 - 35.34. Diary 16 located in a factory hall - N 40 - 48.57 / E 5 - 34.83. Diary 17 located in the building - N 40 - 48.30 / E 5 - 32.87. Diary 18 it is in the small office - N 40 - 45.18 / E 5 - 33.39. Diary 19 located close to the conductor on the second floor - N 40 - 44.98 / E 5 - 35.24. Diary 20 can be found on the balcony - N 40 - 44.88 / E 5 - 35.36. Diary 21 located in a farmhouse - N 40 - 45.83 / E 5 - 35.42. Diary 22 located on the roof of the building, the green blind - N 40 - 45.72 / E 5 - 37.15. Diary 23 located behind the burning buses - N 40 - 45.25 / E 5 - 37.87. Diary 24 can be found between the counterweights - N 40 - 44.41 / E 5 - 37.82. Diary 25 located in the garden of orange temple - N 40 - 44.07 / E 5 - 38.17. Diary 26 located at the gas station - N 40 - 44.35 / E 5 - 38.45. Diary 27 located on the roof of the building - N 40 - 44.22 / E 5 - 38.68. Diary 28 can be found on the blue crane - N 40 - 44.21 / E 5 - 39.30. Diary 29 located on the balcony of the house near the road - N 40 - 43.94 / E 5 - 39.99. Diary 30 located on the second floor of the house - N 40 - 43.71 / E 5 - 40.15. Diary 31 located on the playground - N 40 - 43.94 / E 5 - 40.66. Diary 32 located on the roof - N 40 - 43.76 / E 5 - 41.60. Diary 33 can be found behind the red-yellow-white house - N 40 - 43.91 / E 5 - 41.65. Diary 34 located between the flower pots - N 40 - 43.82 / E 5 - 43.38. Diary 35 located west in the house - N 40 - 43.77 / E 5 - 43.50. Diary 36 located in the corner house on a balcony - N 40 - 44.54 / E 5 - 44.18. Diary 37 located on the table with the umbrella - N 40 - 44.15 / E 5 - 45.36. Diary 38 located between the clotheslines of the yellow house - N 40 - 44.25 / E 5 - 45.59. Diary 39 located in the destroyed factory, west - N 40 - 45.23 / E 5 - 46.21.